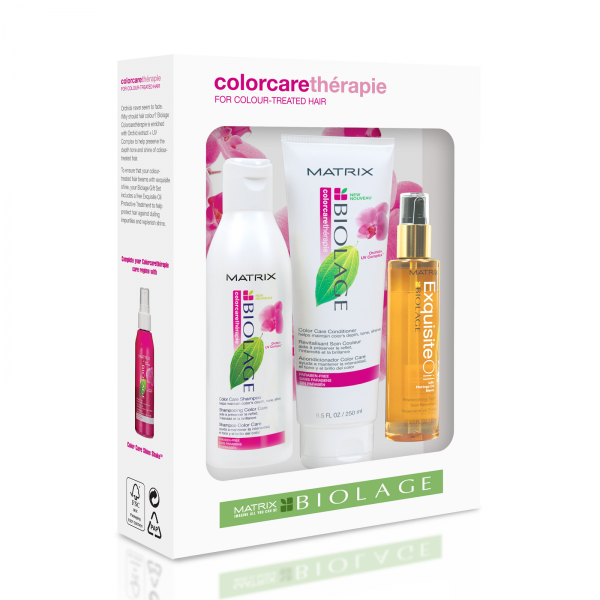 Product information "Matrix Biolage Colorcaretherapie Gift Set"
Orchids don’t seem to fade; so why should your hair colour? Inspired by the non-fading orchid; Biolage has designed Colorcarethérapie which combines professional low pH formulas with orchids and UV Complex to moisturise; preserve and protect the depth; tones and shines of colour-treated hair. Gift set contains: colour care shampoo (250 ml); colour care conditioner (200 ml) and Exquisite Oil replenishing treatment (92 ml). Related links to "Matrix Biolage Colorcaretherapie Gift Set"
Customer evaluation for "Matrix Biolage Colorcaretherapie Gift Set"